I’m in awe of skilled musicians. Because I play the flute myself (and a few other instruments), I know how long it takes to become even quasi-proficient. For this month’s fantasy music feature, I wanted to share the Harry Potter theme played by Jarrod Radnich of The Piano Guys. Watch his fingers. What’s your favorite movie soundtrack? And what skill are you in awe of? What’s the Point of Fairy Tales? Last weekend I sat down with a long-awaited treat—The Tales of Beedle the Bard. 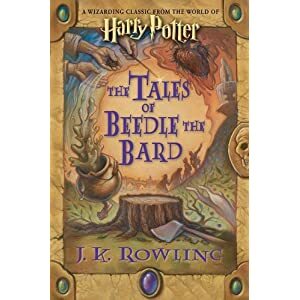 If you’ve read Harry Potter and the Deathly Hallows or watched the movie, then you’ll recognize The Tales of Beedle the Bard as the book of wizarding-world fairy tales containing “The Tale of the Three Brothers” (who owned the Deathly Hallows). Before I tell you what I thought of the book, I think we have to answer one essential question. What’s the point of fairy tales? Like all stories, fairy tales are meant to entertain, but that’s secondary. Unlike today’s novels, their main purpose is to give a moral in a way the audience will remember. They exist to teach a clear lesson. In this, the stories in The Tales of Beedle the Bard only partially succeed. I can hear the argument now. Yes, but The Tales of Beedle the Bard are supposed to be fairy tales for wizarding children, not Muggles. People can’t actually perform magic, so you can’t expect a moral for us. Magic, enchantments, and witches show up all the time in fairy tales. The Tales of Beedle the Bard aren’t unique in that way. And they’re not exempt from needing to teach a lesson to anyone who reads them. Okay, you might say, but The Tales of Beedle the Bard are just supposed to be something fun and extra for people who loved the Harry Potter books. Part of what made the Harry Potter series popular was we could still relate to the stories even though we couldn’t perform magic and would never need to fight a dark wizard. The stories and characters transcended the details of the magical world to tell a story of a boy who longed for a family that loved him, who just wanted to fit in, who struggled to figure out the line between right and wrong, and who learned that some things are worth fighting and dying for. You don’t need to be a witch or wizard to relate. The lessons in Harry Potter, while secondary to an entertaining story, are what made it so loved by people who wouldn’t otherwise read a fantasy. It’s also what makes them re-readable. If you didn’t like the Harry Potter books, The Tales of Beedle the Bard aren’t worth reading. For those of you who are curious, here are the five tales in the book. Three witches and a knight overcome obstacles to try to bathe in the Fountain of Fair Fortune, which is supposed to give good fortune to one person per year. They get through the obstacles based on luck and, in the end, none of the three witches need to go in because their problems are already solved. The knight goes in and, made brave, proposes marriage to one of the witches. They all leave happy, and “none of them ever knew or suspected that the Fountain’s waters carried no enchantment at all” (35). The moral would likely be that we make our own good fortune in life, but the fact that a lot of things in the story happen due to luck rather than skill or hard work actually dilutes this moral. A wizard thinks people act foolishly when they fall in love, so he takes his heart from his chest and locks it away. Left in isolation, it grows withered, dark, and hairy like a beast. When he finally takes it out again, he ends up killing a maiden and cutting out her heart because he wants to replace his with hers. The wizard moral is that even magic can’t make you invulnerable to every physical, mental, and emotional pain. The Muggle moral could perhaps be that, if we don’t open ourselves up to love, we shrivel and become savage? A king wants to be the only one in the kingdom to possess magic, so he gives an order to hunt down all magical folk. An old witch tricks him into rescinding this order. Honestly, while this is a cute story, I can’t figure out what the moral for magical children would be. As for the moral for us non-magic folk…“don’t lie” is the best I can come up with, but it doesn’t entirely fit the story. Three brothers cheat death by building a magical bridge over a dangerous river. Death gives them each a wish. The aggressive first brother wants an unbeatable wand. The arrogant second brother wants a stone that will bring the dead back to life. The wise third brother wants to remain unseen by Death. The first and second brothers end up dead because of their wishes. The third brother meets Death as an equal once he’s old. The moral for magic folk and Muggles alike is that death is inevitable. The best you can hope for is to postpone it until you are old and live a full life. This is the best of the fairy tales in the book, and the only one that I think works perfectly. Do you think I’m wrong about the purpose of a fairy tale? If you’ve read The Tales of Beedle the Bard, am I being too harsh? Did I Eat All The Bertie Bott’s Beans Flavors? Earlier this week, in my Behind the Scenes post on Bertie Bott’s Every Flavor Beans, I let you vote on whether you wanted to know how my box of Every Flavor Beans tasted and whether I ate them all—even the vomit-, booger-, and rotten egg-flavored ones. Since I received a resounding “yes” . . .
After arranging our beans in the order we each planned to eat them (we ended up being opposite), my husband and I used a round of rock-paper-scissors to decide who’d eat the first bean. I lost. Until I chewed, I honestly believed those little Jelly Bellies were going to taste good and be awful in name only. I was wrong. Oh so wrong. “How was it?” my husband asked. The black pepper tasted just like black pepper, the soap like when you get shampoo in your mouth in the shower. The earwax, despite its name, tasted like the wax lips I used to have as a kid at Halloween. Overall, none of them were that terrible, but I knew from my husband’s reaction that the worst was yet to come. The dirt bean came next and tasted like wet bark and mud (please don’t ask how I know what that tastes like). The sausage? Well, let’s just say meat and jelly beans should never go together. And then all I had left was the earthworm, the vomit, the booger, and the rotten egg. Earthworm apparently tastes like raw, moldy beets. I’d be lying if I said that by the time I finished the earthworm bean I didn’t consider simply swallowing the vomit, booger, and rotten egg beans whole like pills. Then I could honestly say I’d eaten them, but I wouldn’t have had to taste them. Except that would have been cheating. So I chewed that vomit bean. And I’m sad to report it reminded me exactly of the taste you get in your mouth when you almost throw up. I looked at my husband, who only had black pepper, soap, and grass left (and who was smirking at me). His plan of eating the terrible ones first suddenly looked brilliant. I stared down my booger bean, and it stared back at me in all its mocking greenness, looking innocently like what I’d come to expect a juicy pear Jelly Belly to look like. And I forgave him the mild profanity because that’s exactly where the booger bean belonged. Only one bean now stood between me and being able to claim the distinction of having eaten every awful Bertie Bott’s Every Flavor Beans flavor that came in our boxes—rotten egg. For the love of all things good, if you do buy a box of Bertie Bott’s Beans, do not eat this flavor. I tried. I really did. But this is like the Death Star of jelly beans. I couldn’t manage to get it down. Not only could I not get it down, I spent a couple minutes gagging over our kitchen sink while my husband laughed. To think I once thought cinnamon jelly beans were as bad as it got. I can safely say that we won’t be buying Bertie Bott’s Every Flavor Beans again. At the same time, it was the most we’d laughed in weeks, and for that alone, it was worth it. Next time, though, I think I’ll stick to chocolate frogs. If you want to go even farther behind the scenes, Jelly Belly also sells Bean Boozled, where flavors like chocolate pudding and canned dog food look identical. You won’t know what you’re eating until you chew. Is there a flavor of jelly bean that you would absolutely refuse to try? [Harry] finally tore his eyes away from the druidess Cliodna, who was scratching her nose, to open a bag of Bertie Bott’s Every Flavor Beans. My husband and I found them while on a quest for jelly belly jelly beans—Bertie Bott’s Every Flavor Beans. As huge fans of the Harry Potter books and movies, we couldn’t resist. Since any jelly beans we bought were going to be part of my mother-in-law’s early Christmas gift to us, we each got ourselves two of the palm-sized boxes. On the drive back to our hotel, I pulled a box from my bag and started reading the flavors. All the ordinary ones were listed—banana, blueberry, candy floss, cherry, green apple, marshmallow, lemon, tutti-frutti, and watermelon. But the box also held some of the strange flavors like earwax, black pepper, and yes, even booger, that the Bertie Bott’s Every Flavor Beans in the books are so famous for. I read them out to my husband. My husband, Harry Potter expert that he is, argued that maybe they would taste just as terrible as in the books. After all, not knowing what flavor you’re going to get, whether it will be delicious or disgusting, is part of the appeal of Bertie Bott’s Every Flavor Beans. Maybe if I was a 10-year-old boy, I’d agree with him. I can still remember being ten years old and being tricked into eating a sour gumball a boy in my class promised was coated in sugar. He laughed hysterically at my puckered face. 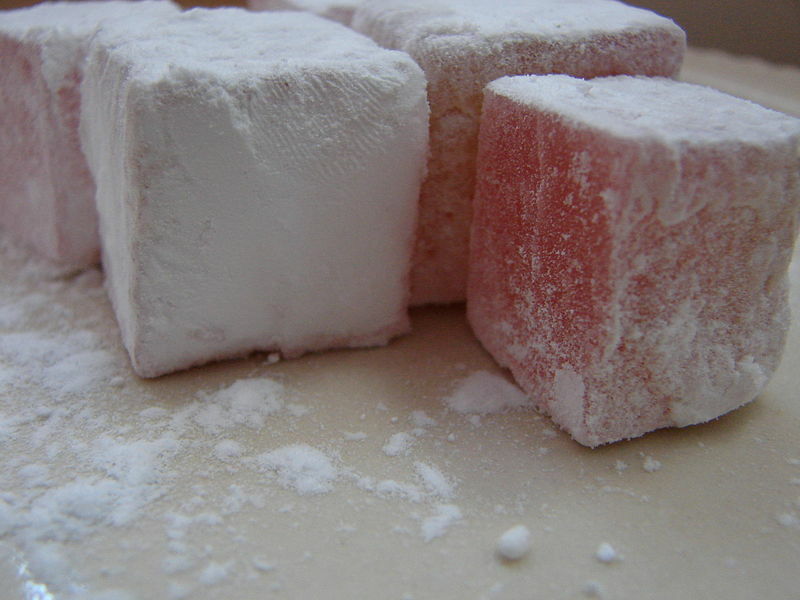 But I’m not a 10-year-old boy, and the mere thought of eating jelly beans that might really taste like earthworm or soap made my stomach turn. I decided I’d start with the dirt-flavored Bertie Bott’s bean, and if it wasn’t too terrible, I’d move on to the sausage, working my way through the flavors. As we divvied up our boxes to make sure we each got to taste every flavor, the question became, if the dirt bean tasted like dirt, would I throw myself on the altar of providing the full story and try every one? Would I even try the vomit-flavored one? But I thought I’d take a vote to find out if you’d like to know whether they taste good or bad 🙂 Send out a tweet, @ me in a Google+ post, or comment to let me know your vote. Yes = Please tell us if the dirt bean really tasted like dirt, and if you ate the vomit, booger, and rotten egg beans anyway. No = I’d rather not know. If Bertie Bott’s Every Flavor Beans really did taste like every flavor, would you still try them? And would you like to know if they taste good or bad? The answer to the question Did I Eat All the Bertie Bott’s Flavors? is now posted!